(Clitoria Ternatea), an antioxidant in traditional medicine. The infusion of Blue Pea gives this Gin its striking colour, while the alchemy of this unusual botanical is further revealed when the Gin is mixed with a good tonic, changing the colour to light pink. Six Dogs Blue is a classic dry Gin with hints of freshly-cut Lucerne over hand-picked and morning-harvested Rose Pelargonium. 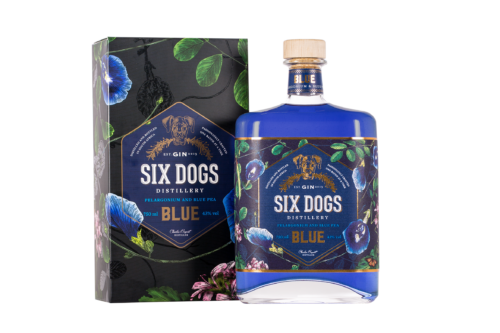 Six Dogs Blue is a party Gin that offers a touch of magic – beautiful by itself and when mixed with tonic, it can also be enjoyed with a variety of garnishes from berries in season to herbs and spices to rose petals.